Bob White was born in 1940 in Geneva, Illinois. After attending DePauw University in Greencastle, Indiana, for 2 years, Bob enlisted in the U.S. Army on November 29, 1960. Pvt White completed basic training at Fort Leonard Wood, Missouri, in February 1961, and then served with the 249th General Hospital at Fitzsimmons General Hospital in Denver, Colorado, from February 1961 until he left active duty and entered the Army Reserve on September 12, 1962. He reenlisted and returned to active duty in the Army on August 24, 1965, and again completed basic training at Fort Leonard Wood in November 1965. Specialist White then entered the Warrant Officer Candidate program and completed Rotary-Wing Flight School at Fort Rucker, Alabama, in August 1966; receiving his appointment as a Warrant Officer in the U.S. Army at the same time. He next completed Aircraft Maintenance Officer training at Fort Eustis, Virginia, in December 1966, followed by service with the 1st Cavalry Division in South Vietnam from January 1967 to January 1968. During this time, Warrant Officer White received his commission as a 2d Lt in the Army on December 2, 1967. 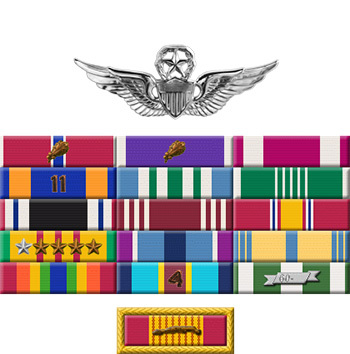 He served at Fort Eustis from February to September 1968, and then attended the Fixed-Wing Qualification Course at Fort Stewart, Georgia, from September 1968 to January 1969. Lt White returned to Fort Eustis from January to June 1969, and then completed OV-1 Mohawk transition training at Fort Rucker and at Fort Huachuca, Arizona, in September 1969. His next assignment was as an OV-1 pilot with the 1st Aviation Brigade in South Vietnam from October 1969 until he was forced to eject from his stricken aircraft over South Vietnam and was taken as a Prisoner of War on November 15, 1969. After spending 1,234 days in captivity, Captain White became the last American Prisoner of War released during Operation Homecoming on April 1, 1973. He was briefly hospitalized to recover from his injuries at Fort Eustis, and then attended the Aviation Maintenance Officers Course at Fort Eustis from August to October 1973, followed by the Aviation Refresher Course, UH-1 Refresher Course, Fixed-Wing Qualification Course, and the OV-1 Refresher Course between October 1973 and February 1974. Captain White served with Headquarters U.S. Army Transportation Center and Fort Eustis from February 1974 to 1976, and then received an assignment to complete his college degree from 1976 to 1977. His next assignment was to CH-47 Chinook transition training at Fort Rucker, followed by service as a CH-47 pilot with the 179th Aviation Company at Fort Carson, Colorado, from December 1977 to May 1978. Major White served as an Aviation Maintenance Officer with the Division Material Management Center at Fort Carson from May to December 1978, and then as as a staff officer with Headquarters Division Support Command at Fort Carson from December 1978 to June 1979. His next assignment was as Airfield Commander with the U.S. Army Garrison at Fort Carson from July 1979 to May 1980, followed by service as an Advisor to the U.S. Army Reserve at Fort Jackson, South Carolina, from June 1980 to October 1982. Major White attended the Rotary Wing Aviator Refresher Training Course at Fort Rucker from October to November 1982, and then served as Deputy Commander for Operations with the 205th Transportation Battalion in West Germany from December 1982 until his retirement from the Army on March 1, 1985. 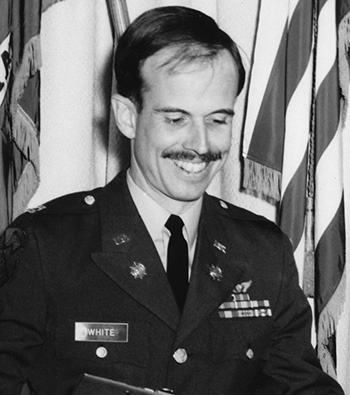 Captain Robert T. White, Transportation Corps, distinguished himself by meritorious service in connection with military operations against an opposing force while serving as a Prisoner of War in the Republic of Vietnam and Cambodia from 15 November 1969 to 1 April 1973. During this period, Captain White performed duties in such a manner as to maintain good order and discipline. Captured in the jungles of the Republic of Vietnam, he endured periods of interrogation, starvation, inadequate or nonexistent medical care and was provided totally inadequate shelter. Because of the frustration and hatred built up in his mind over the long years and the constant harassment of the Vietnamese, many difficult situations arose which required perseverance, endurance, and ingenuity. With calm tenacious effort, he overcame those obstacles and never wavered in loyalty to his country. Throughout this period, he exhibited outstanding professional skill, knowledge, and leadership while suffering physical pain and mental stress. HIs behavior and performance as a Prisoner of War in the face of an armed enemy clearly marked him as an exceptional soldier and American. His resistance to enemy pressure was often accomplished at grave risk of personal bodily harm. Captain White's courage, aggressiveness, and leadership by example were in the highest traditions of the military service and reflected great credit upon himself, the military service and the United States of America.